New York, NY – GLORY, the world’s premier kickboxing league, today announced two match-ups for GLORY 29 Copenhagen and GLORY SuperFight Series Copenhagen on April 16. Two Danish fighters will face off in the co-headline bout of GLORY 29 Copenhagen, when aggressive veteran Mohammed “The Desert Storm” El-Mir (110-17, 33 KO) meets rising prospect Niclas “The Destroyer” Larsen (40-7-1, 20 KO) at lightweight. Now added to GLORY SuperFight Series Copenhagen is the lightweight scrap between GLORY newcomers Hysni Beqiri of Switzerland and Armenian-Belgian Harut Grigorian. 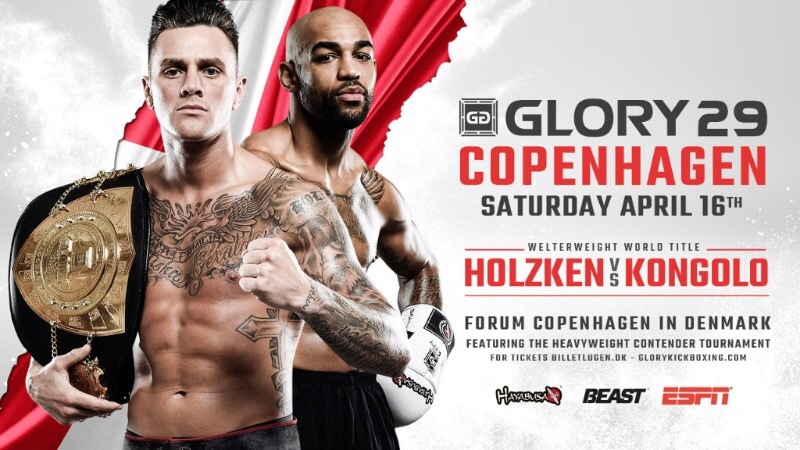 Hosted by Forum Copenhagen in Denmark, GLORY 29 Copenhagen is headlined by GLORY Welterweight World Champion Nieky “The Natural” Holzken (88-11, 46 KO) defending his title for the second time, taking on Swiss striker Yoann Kongolo (61-6, 45 KO), currently ranked No. 4 in the world. Additional match-ups for GLORY 29, including the participants in a one-night, four-man Heavyweight Contender Tournament to determine the next challenger for the GLORY Heavyweight World Title, will be announced soon. Tickets for GLORY 29 Copenhagen and GLORY SuperFight Series Copenhagen are priced between 275 DKK and 1275 DKK and are available for purchase at billetlugen.dk. Founded in 2012, GLORY is owned and operated by GLORY Sports International (GSI), a professional martial arts organization and television content provider that maintains offices in New York, Denver, London, Amsterdam, and Singapore. GLORY programming is seen in over 200 countries. GLORY kickboxing rules are comprised of a mix of several combat disciplines including Karate, Muay Thai, Tae Kwon Do and traditional Boxing. Like us on Facebook, follow us on Twitter @GLORY_WS, and visit us online at glorykickboxing.com.